Perhaps it is because the first website I ever visited (June, 1994) was The Louvre. Or maybe it is because I wrote my undergraduate thesis on “Contemporary Additions to Beaux Arts Museums.” Or it might be because I spend my time exploring how digital technologies can help people navigate the world. 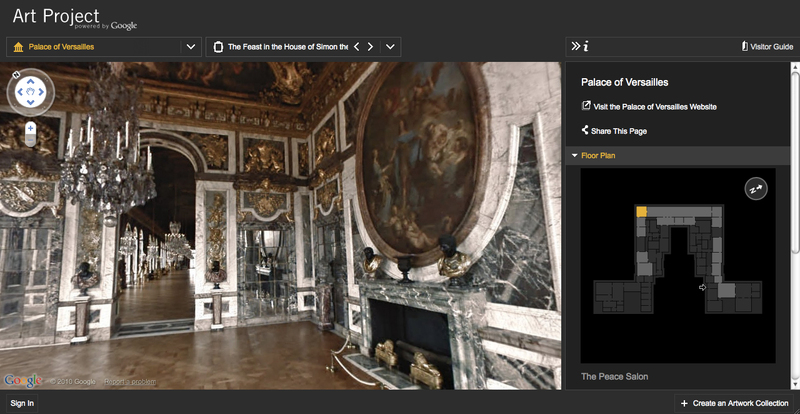 Whatever the reason, I was thrilled today to discover Google’s Art Project, a virtual VIP pass to 17 of the world’s greatest art museums. Visitors to the site can browse the museums’ major galleries in street-view fashion, floating through halls and galleries, pivoting to take in paintings and sculptures that encircle our patron’s eye view. For our private tour, no visitors block our sight-lines or interrupt our contemplation with chatter about lunch plans. Along our journey, we can stop to immerse ourselves in any of over 1,000 works of art for which Google has captured high-resolution images. In addition, each museum features one work of art at super-high resolution of about 7 billion pixels! 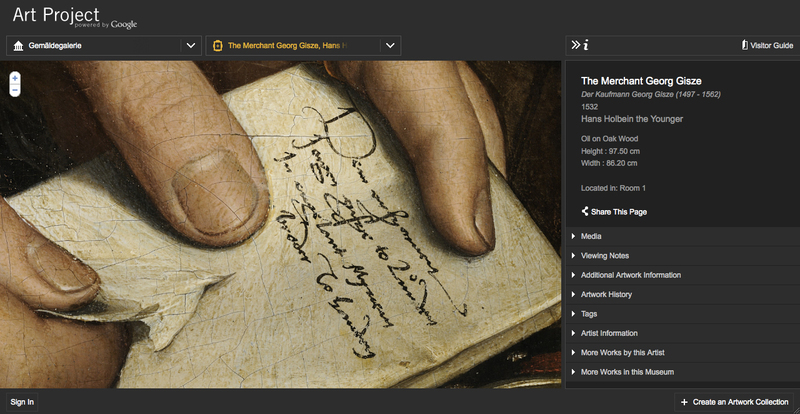 Zoom into The Merchant Georg Gisze by Hans Holbein and read the note he holds in his fingertips. 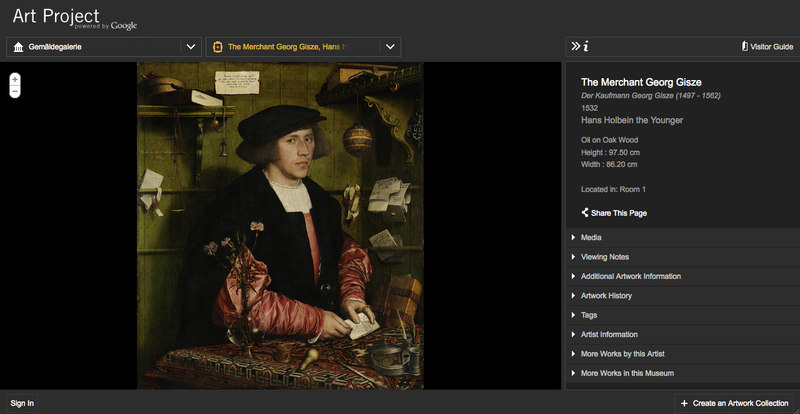 More information about the artist, the painting, and the museum is available in the pane on the right. (Read how Google employees created this site on their personal project time on Google’s official blog). A regrettable symptom of the ever-expanding web is that we have become immune to the new. Art Project combines attributes that we’ve seen before: Google’s conquest of content and its unmatched navigational technology, so it is easy to discount the site’s potential impact. And yet I believe Art Project gives us so much more than we’ve been able to experience online up until now. By interacting with the art in its own physical surroundings, we can tour the museum with a curator’s eye, appreciating the narrative of each gallery and experiencing the great architecture of these museums. 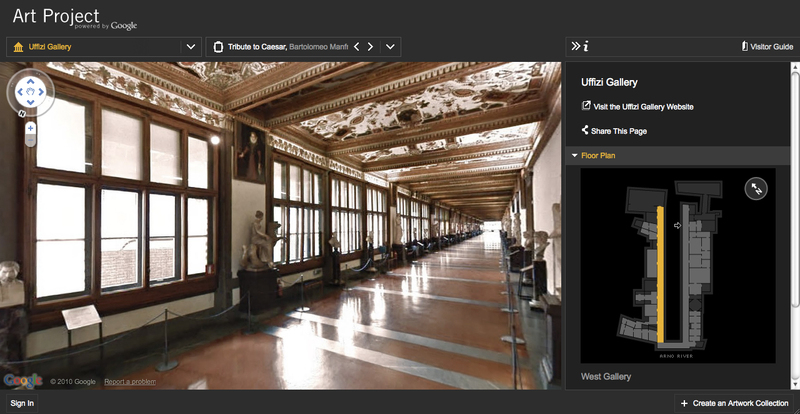 For instance, my mother has always marveled at the Uffizi’s long arcades and now I can see them as she did. It may not rival being there in person, but it’s only a mouse-click away anytime I choose to wander through it. 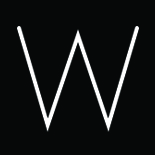 Take a few minutes and visit Art Project — allow yourself to be astonished and delighted by this remarkable website. See what the New York Times’ Roberta Smith thinks of Google Art Project in the Critic’s Notebook. This entry was posted on February 2, 2011 by lwolke in Blog.